Country-style spare ribs are moist and tender when braised low and slow and taste delicious accompanied with red cabbage and apples. When I was a kid, we had spareribs and sauerkraut a few times a year in fall and winter. I was never a fan of the regular spareribs. Too greasy and not enough meat. Somehow, those spareribs taste better when cooked low and slow on the barbecue with a tangy red sauce. My mom mixed up the type of meat she used throughout the season and I was happiest when she chose country-style spareribs. These are thick and meaty and when cooked properly, fall-apart tender. Country-style ribs are more pork chop than ribs. This cut, which is very meaty and less fatty than spareribs, is from the front end of the baby back ribs and are an economical cut. Cook low and slow, known as braising, which melds the delicious flavors of the meat and vegetables. Braises are best made the day before; defat the top before reheating. Tip: I rarely brown my meat before braising anymore. I really can’t tell the difference with low and slow cooking. Lots of flavors are released during cooking that more than compensate for not browning. For this recipe I chose to use fresh red cabbage and Granny Smith apples with thinly sliced, caramelized onions, stock and apple cider. Caraway seeds and juniper berries (use a disposable tea filter bag for easy removal) nicely complement the pork and the vegetables. Five minutes before serving, add the vinegar and dill, stir and serve! 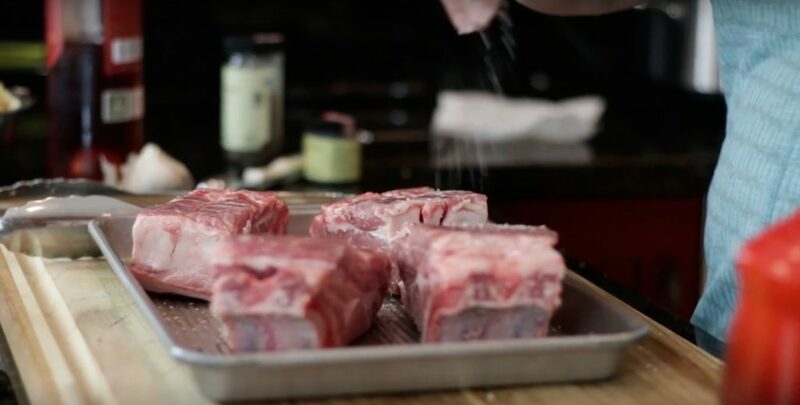 Watch the Country-Style Spareribs with Red Cabbage and Apples Here. Cook this either in a slow cooker or on the stovetop. If you have the time, cool and refrigerate overnight to allow the flavors to meld. Generously season the ribs with salt and pepper. Heat the oil over medium heat in a heat-tolerant slow-cooker insert or large Dutch oven. Add the onion to the hot pan and sweat for 5 minutes, Continue cooking until lightly caramelized, about 10 minutes more. Watch the heat, don’t burn the onions, add a little water as needed to deglaze the pan or loosen the caramelized onion juices from the bottom of the pan. This is what colors and flavors the onion. Stir in the cabbage, apples, garlic, caraway seeds and juniper berries, stock and apple cider. Tuck the ribs into the vegetables and bring to a boil. Slow Cooker: Remove the insert to the slow cooker, cover and set on low for 6-8 hours, the timing will depend on the amount of heat your slow cooker generates, until fork tender. Turn the pork half way through cooking. Stovetop: Reduce the heat to low (barely a simmer), cover and cook for 2-3 hours, until fork tender, checking to make sure the liquid is not boiling. Remove the ribs to a warm platter and cover. Stir in the vinegar or lemon juice and dill and cook, uncovered, for another 5 minutes. Add the cabbage to the platter and serve.